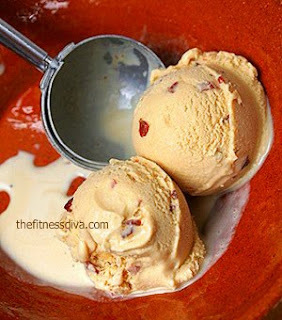 Fierce Diva Fitness: Bacon Ice Cream - They Really Are Just Trying to Kill Us, Aren't They? Actually tried it and it wasn't terrible. The salty/ sweet combinations works better than you think( such as chocolate & peanut butter or chocolate and pretzels). Truthfully a small bit of bacon gives off a lot of flavor, so they don't have to use a lot of it...so it doesn't make it much worse nutritionally than a scoop of plain vanilla. Not that its good for you... just it won't kill you any faster than plain ice cream. I'll have to taste it, I guess. Wow! Are you kidding me? I'm with ya on this one, Fitness Diva. You made me cringe with the thought of mayonnaise ice cream. I think many might mistake that for vanilla at first glance though. LOL! I'm not lining up for a taste test on it! I'll have to pass on this one. Heaven knows I have enough unhealthy foods I need to unload and ditch rather than exploring for MORE. But I'm still curious about the taste. Nevertheless ... what will we think of next????? It makes me shudder. This is where most ice cream makers should just stop. Regardless if it's tasty or not, bacon should be associated with ice cream in the first place. I don't think 'd ever want to eat that. Bacon is good as ice cream is good but mix them altogether and what do you get? don't even have the stomach for it. This must be very yak! Do you know about the "garlic taste ice cream"? Bacon and ice cream doesn't even sound good at all. I would never try it. Yuck the creators can have it. that sounds just so wrong!!! Kathy has got to see this!!!! There's a place for sweet and savory mixtures, but this ain't it. Ugh. Although I did once have a garlic cookie and it tasted really good. I don't know. Maybe if someone offered me money, I'd try it. Anyone? This is just hard to imagine! It just seems to me that you wouldn't even be able to taste the bacon. It just doesn't make sense? But someone actually likes this unhealthy "treat". Doesn't sound wonderful...I would try it if someone else purchased it but I wouldn't buy it! Hey what ever there is nothing with which we can compare Bacon Ice cream. I am agree with your views. Thanks a lot for this nice post. Keep up the good work. I would like to try this ice-cream. No matter what, eating ice-cream is going to get fat. So does it really matter if there is bacon in it? I don't think so! This is just hard to imagine! It just seems to me that you wouldn't even be able to taste the bacon. It just doesn't make sense?Bacon and ice cream doesn't even sound good at all. I would never try it. Yuck the creators can have it. Awwh..How could anyone even think about mayonnaise ice cream; i can't imagine how terrible it is going to be. Like VetTech mentioned, the salty and sweet mix is probably the main draw. Meat and ice cream don't seem likely to mix. How do you make a fattening product even worse? Sprinkle in some fattening breakfast meat.